Ceiling mounted blow through air coolers of the ML range (M=mini, L=low) are suitable for commercial cooling, for all common refrigerants, with the exception of ammonia. 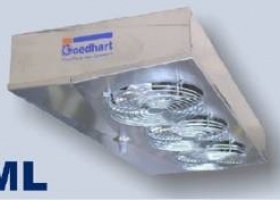 Due to their compact dimensions and universal fin spacing, the ML coolers are suitable for cooling cabinets, preparation rooms and small freezing rooms with low ceiling height. The ML range consists of three basic types with duties between 1,2 to 4,4 kW.